Skin scars are common. They can occur due to infection in the skin or due to injury. Treatment of scars can sometimes be hard, and in this article we shall take a look at this a bit closer. In particular, we will take a look at treatment of acne scars as well. Scars occur in areas where skin has been injured due to trauma, burns and infections such as acne. These injurious stimuli result in damage to the collagen protein within the skin, which when healing can become disarranged resulting in an unsightly scar. Acne is a troublesome clinical condition characterised by the formation of small pus filled skin lesions. They are predominantly caused by the skin bacteria Propionibacterium acnes. The problem with acne is that once it heals, it can sometimes leave scars on the skin that can be cosmetically unpleasant. 1. Keloid scars - These scars occur due to rapid and disorganised healing of an injury. Typically, keloid scars tend to grow beyond the site of injury and can appear quite unsightly. They can be painful and itchy, and are often seen in dark skinned individuals. They are classically seen on the chest. 2. Hypertrophic scars - These are similar to keloid scars but are confined to the injured area. 3. Contracture scars - This is often seen after burns. This results in skin thickening and tightening, and can result in reduced movement of the affected area. 4. Acne scars - These can appear like dark pigmented areas where there was previously acne present. Scar treatments can be many, depending on the type of scar. Creams are available over the counter but may not necessarily be effective. In some cases, advanced surgical treatments may be offered. Steroid injections into the site of the scars can help reduce inflammation and size of the scar. When treating acne scars, it is essential to identify what the factors are that can result in scarring. People will try a number of home remedies to try and get rid of them, but certain steps can actually be more harmful. For example, it will be interesting to know that picking on the acne skin lesion can make the skin collagen heal in an unruly manner, thus resulting in scars. Studies have shown that applying Vitamin E cream can slow down the healing of an acne lesion, and does not help in any way with reducing scar formation. 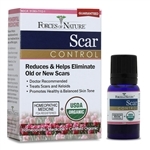 Forces of Nature scar control treatment can offer a safe and effective way of getting rid of scars. 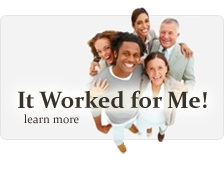 It is specifically designed to penetrate scar tissue and slowly dissolve the scar tissue. As a USDA certified product, it is useful for a variety of scars, and is considered to be one of the best scar treatments available. Following application of the Forces of Nature scar control solution, the scar tissue and discoloration is significantly reduced and healthy skin grows over the surface of the scar, causing the scar to eventually disappear. 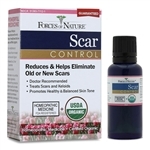 In short, Forces of Nature Scar control solution provides safe, effective and gentle treatment of skin scars.